Domenichino (1581-1641) and assistants, The Transformation of Cyparissus (1616-18), fresco transferred from Villa Aldobrandini, Frascati, to canvas and mounted on board, 120 x 88.3 cm, The National Gallery (Bought, 1958), London. Courtesy of and © The National Gallery, London. Book 10 of Ovid’s Metamorphoses follows the tragedy of Orpheus and Eurydice with two brief stories of people transformed into trees. The first is only mentioned in passing, as a link to the main story of Cyparissus. his human form which hardened in that tree. But his main story is that of Cyparissus, a youth who had been the love of Apollo. A majestic giant stag had become quite tame in that area, and was a favourite of Cyparissus, who used to lead the stag to pasture, and ride it around on occasion. What did not Phoebus say to comfort him? So Cyparissus was transformed into a cypress tree, which has since grown in and by cemeteries, and other places of grief. Although this is a very brief and simple tale, it has attracted the attention of several painters. 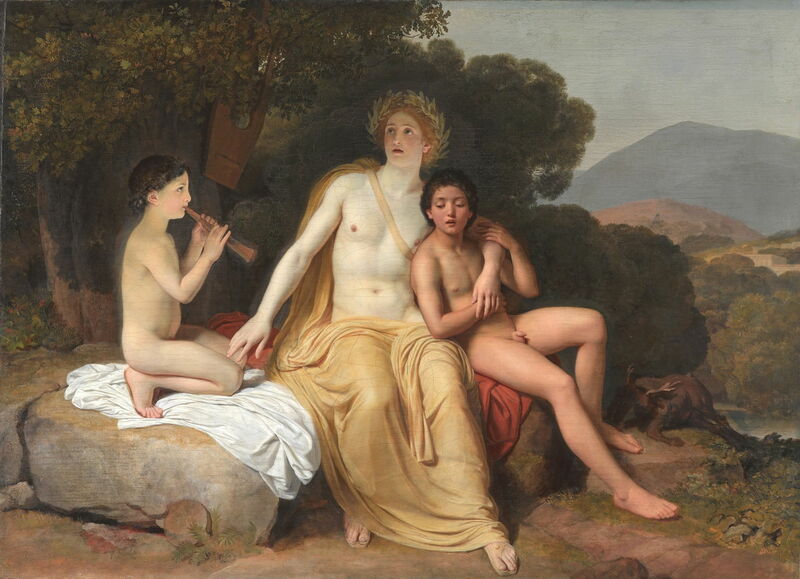 Claude-Marie Dubufe (1790–1864), Apollo and Cyparissus (1821), oil on canvas, 188 x 228 cm, Musée Calvet, Avignon, France. Wikimedia Commons. 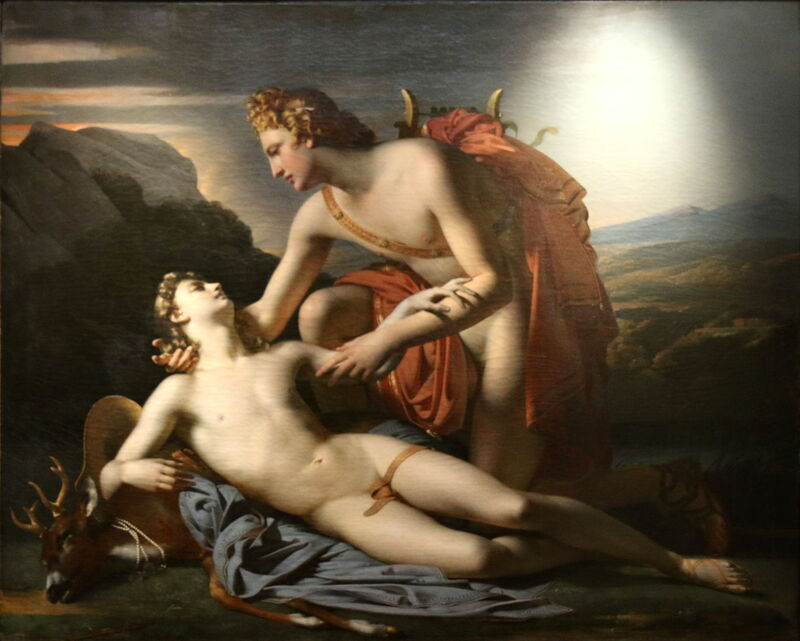 Surprisingly, the fairly overtly pederastic relationship between Apollo and Cyparissus has been shown in several paintings, of which Claude-Marie Dubufe’s Apollo and Cyparissus (1821) is perhaps an early example. 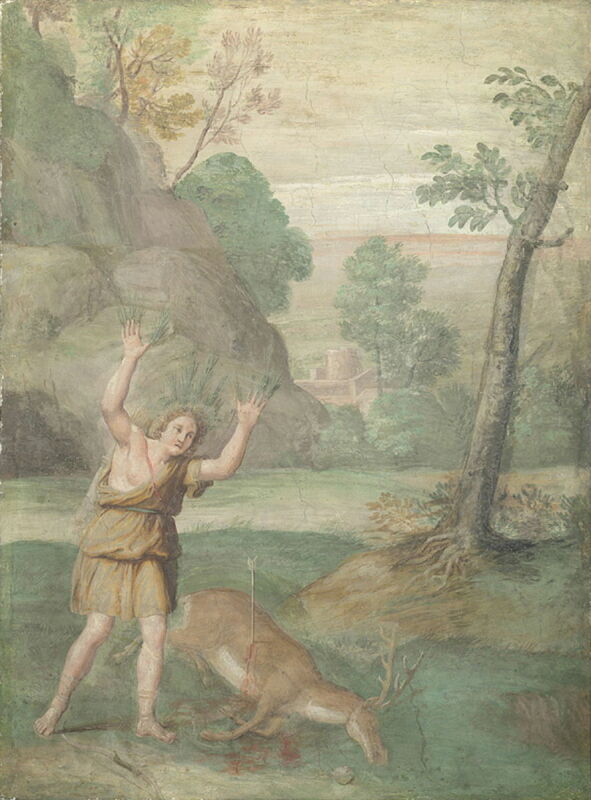 It is hard to know how much of Ovid’s story the artist is referring to here: Cyparissus rests against the stag, but there is no sign of its wounding or death, even though the god is clearly comforting the youth. Alexander Andreyevich Ivanov (1806–1858), Apollo, Hyacinthus and Cyparissus Making Music and Singing (1834), oil on canvas, 100 × 139.9 cm, The State Tretyakov Gallery Государственная Третьяковская галерея, Moscow, Russia. Wikimedia Commons. There is no room for ambiguity in any respect of Alexander Andreyevich Ivanov’s Apollo, Hyacinthus and Cyparissus Making Music and Singing (1834). While Hyacinthus plays the pipes, Apollo embraces Cyparissus. The stag lies sleeping on a rock at the right. By far the best narrative depiction of this myth is that painted by Domenichino and his assistants in the Villa Aldobrandini, Frascati, as part of the Stanza di Apollo in its garden pavilion. He has wisely kept the god out of this section of the fresco, and shows the stag dead on the ground, although killed by an arrow rather than a javelin. Next to the animal’s body, a distraught Cyparissus is already changing into a cypress tree. 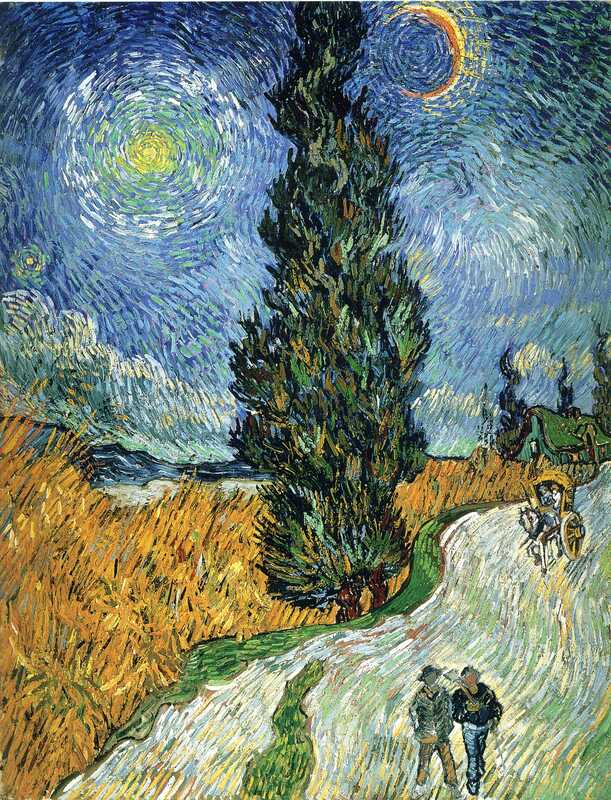 While considering the cypress as a companion of grief, I cannot ignore the greatest paintings of cypresses of all time, particularly in their context of Vincent van Gogh’s imminent fate. He may never have known of this myth, but this painting is surely about the grief of Cyparissus, and of Vincent van Gogh himself. Posted in General, Language, Life, Painting and tagged Domenichino, Dubufe, Ivanov, Metamorphoses, myth, narrative, Ovid, painting, van Gogh. Bookmark the permalink.